Our Chilean exchange students shared a heart-felt message to our community (see below) during their final week at Loyola. These students come from Colegio San Luis Antofagasta, a Jesuit pre-K–12 school in Antofagasta (northern Chile). They have been with us for nearly three months, living with Loyola host families and taking classes here. "In its fourth year, this exchange program is another example of how we are using the Jesuit global network for the betterment of students, both ours and those from Colegio San Luis," said Modern Languages Chair and Exchange Program Director Daniel Ranalli. "In addition to enhancing a student’s ability in a foreign language, the program also emphasizes the understanding of foreign cultures. By having a deeper, more personal understanding of a foreign culture, it is easier for us to relate to others, to empathize with them, and to embrace another facet of diversity. " 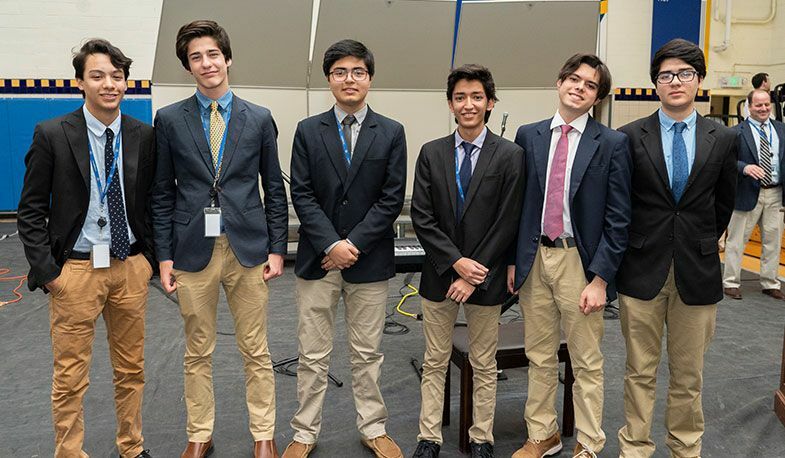 In June, five Dons will spend three weeks at Colegio San Luis as exchange students. From Left to Right: Diego Reitter, Alejandro Véliz, Gonzalo Gutiérrez, Luciano Meza, Alonso Leiva, & Renato Gatica.